You may have heard of an ecological footprint: a calculation of all the resources it takes to supply your day-to-day lifestyle. Well a ‘foodprint’ is the same idea, focusing on the principal resources – land, water, energy, greenhouse gas emissions – needed to feed an individual or an entire population. If we break down everything that people consume in Oxford into the components pieces, it’s possible to see how much ‘stuff’ goes into feeding Oxford. This means analysing what people eat, where it comes from, how it’s produced, how much is wasted, how much is packaged, and how it’s prepared. 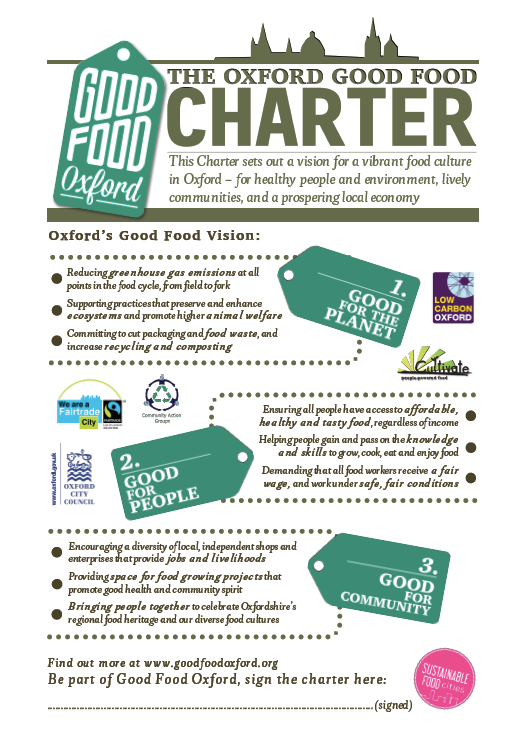 A report commissioned by Oxford City Council and as part of LandShare’s ‘How to Feed a City’ programme carried out just such an analysis for Oxford City, comparing the ‘foodprint’ results to the UK average and to an alternative diet scenario. The study sought to answer what it takes to feed Oxford and where food comes from. Where does Oxford’s food come from? Despite over 50% of food in the city coming from the UK, rather than further afield in the EU or overseas, a mere 1% of the food consumed is locally sourced – mainly from sources such as farmers markets, box schemes, allotments, and direct sale to restaurant. If only vegetables are considered, then the proportion jumps up to 3.5% sourced locally. Where does Oxford’s food go? A startling 12.5 million tonnes of food goes to waste in the UK annually, 65% of which is produced in households. According to WRAP statistics, 64% of domestic food waste is avoidable and another 18% could be, meaning that a great opportunity exists in households to reduce waste. Packaging is another form of waste that can be reduced by retailers and recycled by consumers. For both, Oxford performs slightly better than the national average in terms of wasting food and sending packaging to landfill. So, what does it take to feed Oxford? The resources for growing, processing and manufacturing, transportation, retailing, and preparation add up. About 530 square kilometres of land are needed, but also nearly 400 million tonnes of water – what the Thames provides Oxford on average over 8 ½ months – and energy equivalent to £70 million of oil barrels. 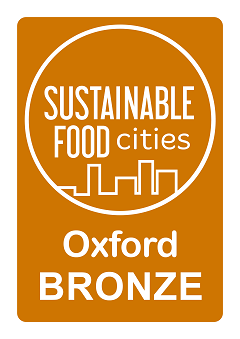 On top of this, Oxford’s food system is responsible for about 20% of the city’s greenhouse gas emissions, twice the annual emissions from all of Oxford’s cars. A food system at risk? The biggest savings for Oxford’s foodprint would come from reducing red meat consumption, food waste, and use of oils and fats in that order. 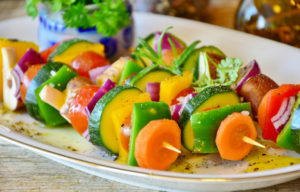 An alternative dietary scenario – reduced meat consumption and increased fruit, vegetables, and grains; elimination of avoidable food waste; higher portion of renewable energy; and increased recycling rates – decreases the amount of arable land needed to produce food enough to feed Oxford, though would require reallocation of land to dairy, fruit, and vegetables to do so locally. While an illustrative exercise to put food demand into perspective, it is more complex when considering the various channels through which food is distributed and redistributed. At the end of the day, though, Oxford relies on centralized distribution channels for food that are highly efficient but leave little flexibility or room to adapt. Finally, according to the report, the biggest gains to be made are in changing personal consumption patterns. While no easy task, this analysis demonstrated the substantial impact cumulative individual actions can make. Curtis, T. 2013. 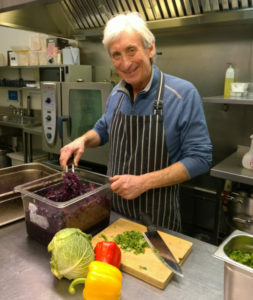 FoodPrinting Oxford: How to Feed a City. 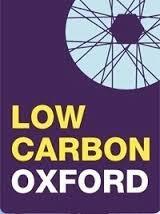 Oxford: Oxford City Council on Behalf of Low Carbon Oxford.